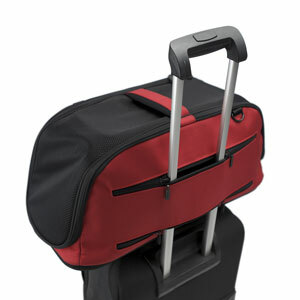 Sleepypod Air is the only airline approved pet carrier that redefines in-cabin pet travel. 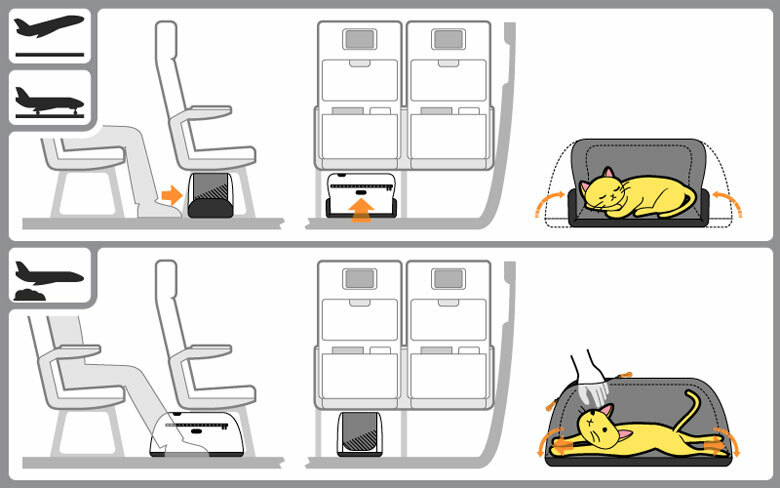 Air adapts to the various under-seat storage requirements set by different airlines while providing maximum comfort for your jet set pet. Air Travel: Worrying about buying a carrier that will not fit under a plane seat is a thing of the past. Our patent pending folding system allows pets to travel in the largest space possible while the airplane is in the air, yet still allows for stowage under an airline seat during takeoff and landing. When the captain says you can recline your seat, rotate the Sleepypod Air so it is between your feet and then expand the ends so both you and your little friend can stretch out comfortably for the duration of the flight. In-cabin pet travel has never been so comfortable. Top and ends are easy breathing dark mesh that opens for easy access. Pass through pocket to secure to telescoping handle on pullmans. Large zipper pockets on both sides provide space for your pet's essential in-flight items. Car Travel: Straps on both sides allow you to secure the Sleepypod Air in your car. 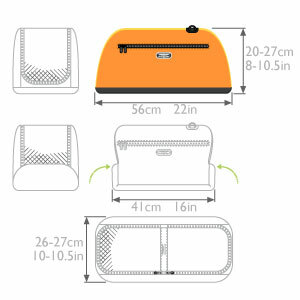 Accessories: The Sleepypod Warmer Kit can be installed in the pocket of the Sleepypod Air Pet Carrier bedding. An access hole lets the cord out through the bottom zipper on the back. The plush cover on the removable foam bed is machine washable. The coated exterior and interior fabric is easily cleaned with a damp cloth. Extra plush bedding is available for purchase in your choice of black or white. Sleepypod Air was put through the same safety testing that continues to position Sleepypod among one of the safest pet product manufacturers on the market. I haven't taken my dog on the airplane yet but I think this carrier will be well worth the price tag. It's versatile, sturdy, and according to my chihuahua, it's also comfortable! Click the button below to add the Sleepypod Air Pet Carriers to your wish list.